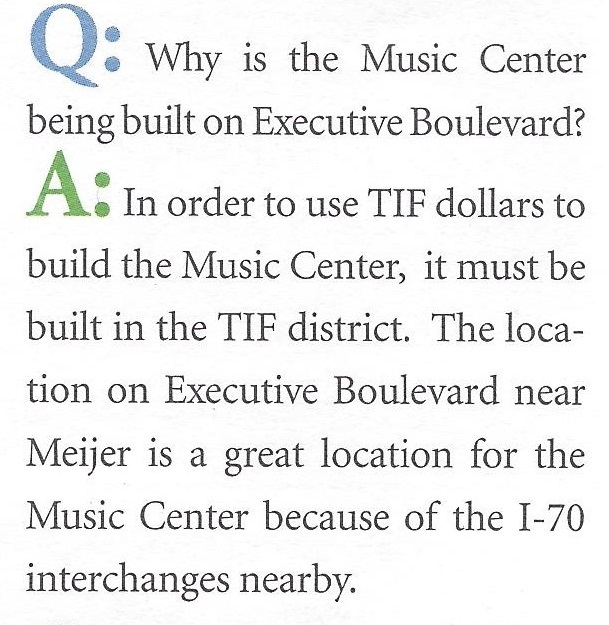 I received the City Brochure that discusses TIF funding and also contains a Q&A section. The responses deserve some clarification. 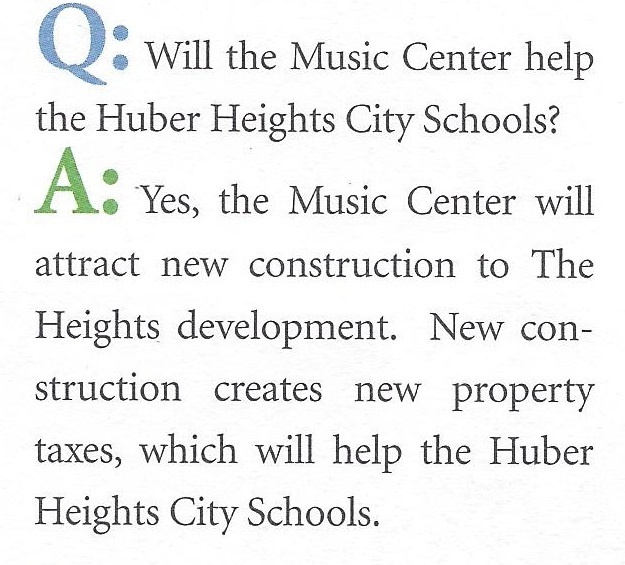 Probably, council has made it so your taxes will probably go up because of the Music Center. It is important to notice that in order to get the best interest rate for the Aquatic Center Bonds the city has to use Income Tax revenue to guarantee payments. See the Oct 8, 2013 Admin committee agenda. This is probably because the banks have done the calculations and figured out that there's not enough money expected to come in to the TIF. This conclusion comes before most of the Music Center money is borrowed. If the banks are right then the city will have to use income taxes to pay off the Aquatic and Music Centers. 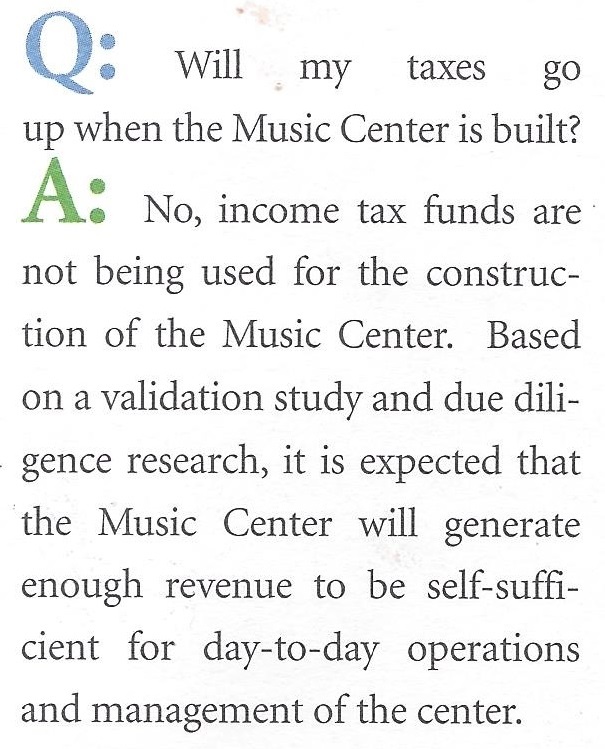 I contend the Music Center will force higher taxes because the Music Center doesn't look like it is going to make enough money to cover operational costs. The conclusion made in the second statement, "Based on the validation study" was written by someone that either didn't read or understand the validation study. If you read it you'll see the only possible way for it to make enough money to cover operations and management is if all the stars align perfectly every minute of the day. TIF money is just another way of saying modified property tax. The city modifies the property tax in such a way that it diverts the payments from where they normally go into a special fund. See a partial explanation showing how one property taxpayer normally would pay $13,000 to police and fire funds but because of the TIF only pays about $500. TIF dollars do not have to be used in the TIF district and even if they did it is easy for the city to include other areas into the TIF. 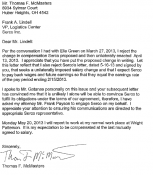 TIF dollars must be used in a manner that "strengthens" the properties that pay into the TIF. 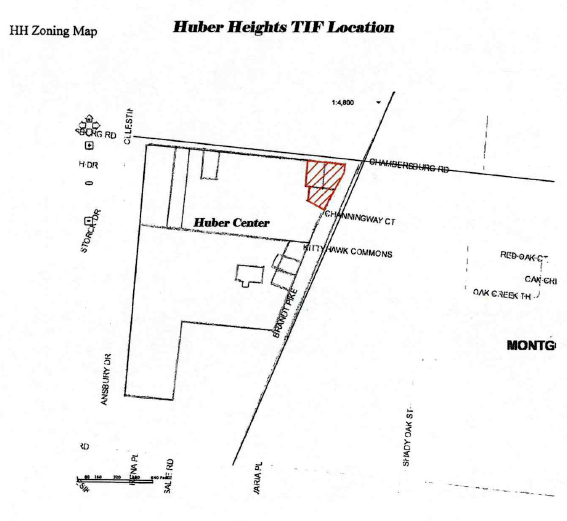 When the Aquatic Center was being built we were told that it couldn't be built in the Huber Center because it was too far away from the TIF district. 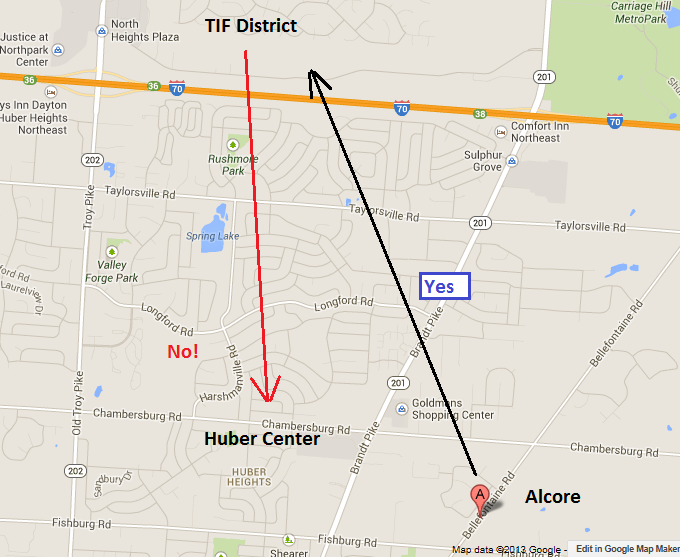 This year the Alcore Assisted Living Center on Bellefontaine and Fishburg was declared a TIF area. 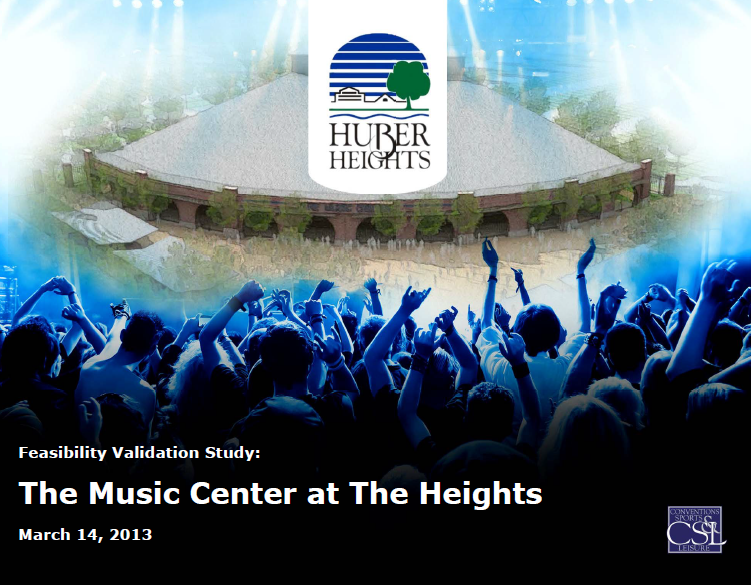 The taxes divert from there will go to pay for the Music Center. Just for reference Music and Aquatic Centers aren't even remotely similar to the list of items found in the definition of Public Infrastructure Improvements found in ORC 5709.40 (7). For TIF properties, the city takes 70% of what the school would normally collect. This is not required by law. 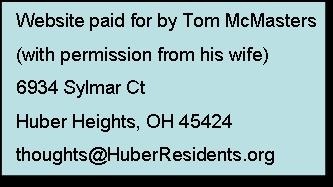 The Ohio revised code for TIF municipalities is 5709.40. Looking at section (D) (1) tells me that the city could give all the TIF money to the schools if they wanted to do this. Other sections talk about the negotiations between the school and the city to determine how much the school will get. 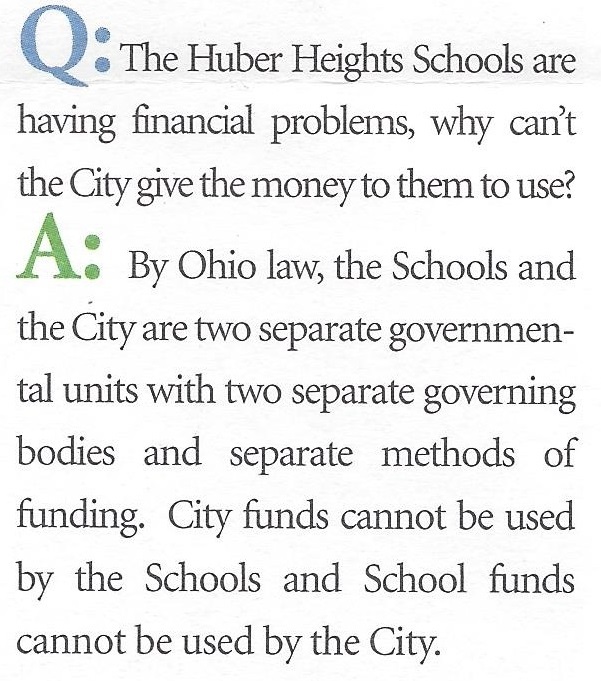 When it came time to negotiate for the Huber Center TIF last November (2012) the City only gave the schools 30% of what the schools would have gotten if the TIF wasn't created. 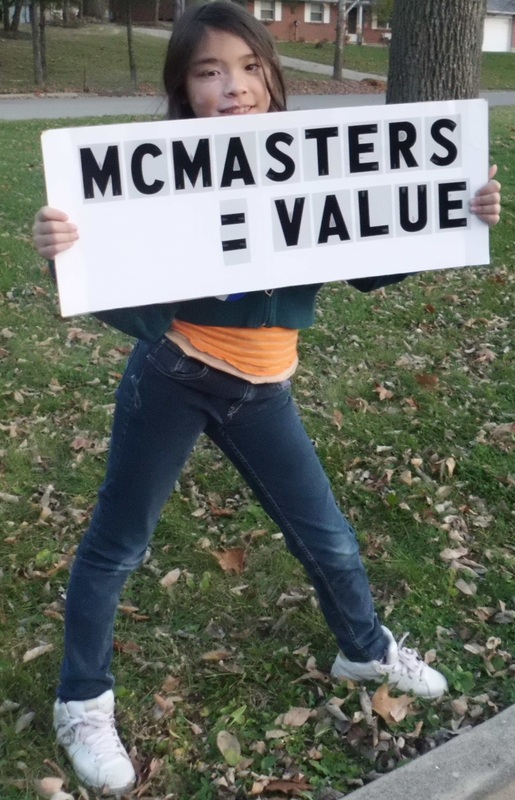 Today the school's are losing tax revenue on the Music Center because the city now owns 33 acres that Miejer use to pay taxes (special assessments) on. If businesses decide to build in "The Heights" keep in mind it will take three new ones just to make up for how much the city takes.